Hay House Inc., 9781401952655, 248pp. If you’re holding this book, it likely means you or someone you love has had a stroke. Dealing with the onslaught of information about stroke can be confusing and overwhelming. 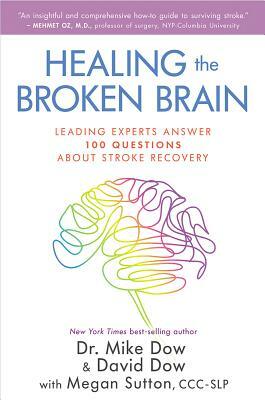 And if you happen to be a stroke survivor with newly impaired language skills, it can be especially hard to comprehend everything your doctors, nurses, and specialists are telling you.This book consists of the top 100 questions that survivors and their families ask, with answers from the top physicians and therapists in the country. The questions start out basic but then get more specific to address different areas of recovery. And, for stroke survivors still struggling with reading comprehension, or for family members who are simply too tired to read long passages, there are Takeaway Pointsat the end of each chapter to help simplify everything.Includes answers to frequently asked questions such as:• What is a stroke, and who is at risk for one?• What is the best diet for a stroke survivor?• How does group therapy compare to individual therapy?• What should a stroke survivor look for in a therapist?• How long will it take to recover, and how can stroke survivors maximize their recovery?• What can someone do to prevent having another stroke?In this book, you’ll gain a wealth of information, inspiration, advice, and support as you navigate your journey through stroke recovery. "An insightful and comprehensive how-to guide to surviving stroke." "A groundbreaking guide for the prevention and treatment of stroke." "As the mother of a child who suffered a life-threatening brain injury, I know the power of combining hope with science in healing broken brains. With this book, Mike and David have provided that combination to all stroke survivors and the family members who believe in them." "Dr. Mike and his brother David reveal a profound truth in this incredible book: spiritual growth and faith are required when faced with life’s most difficult roadblocks." "Patience, mindfulness, and optimism are all tools needed in the recovery journey from a stroke. Dr. Mike Dow and his brother do an amazing job delivering a healthy dose of inspiration and insight. A must read for survivors and caregivers!" — Dr. Susan Albers, New York Times best-selling author of 50 Ways to Soothe Yourself Without Food, Eating Mindfully, and Eat Q. "This book should be required reading for all stroke survivors and the people who love them." "This thorough and compassionate guide for families and survivors will provide relief, comfort, and wisdom to all who read it." "As the family member of a stroke survivor, I know it takes a village of doctors to optimize recovery. Mike and David have delivered this village to all stroke survivors and their families through this life-changing book."